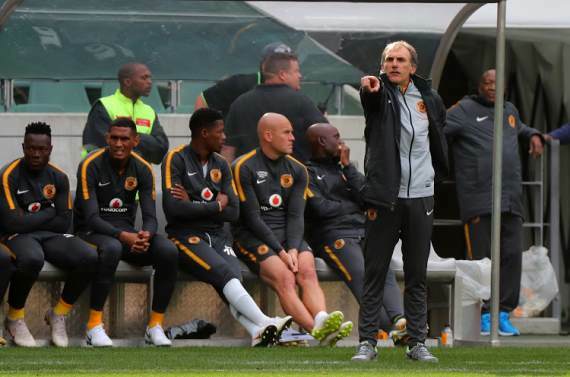 Kaizer Chiefs legend Mark Tovey says coach Giovanni Solinas will be judged on the basis of his results with the team and this could be significant in terms of his future. Solinas did not have the luxury of a pre-season with the Glamour Boys and it appears it has been a challenge to implement his identity and playing philosophy on the team. Thus far in 2018/19 the positive results are yet to arrive consistently with Chiefs resting in seventh position after 14 matches. In addition, the side has exited from both the MTN8 and the Telkom Knockout while also losing to fierce rivals Orlando Pirates on two occasions. However, Amakhosi did have some joy in a CAF Confederation Cup Preliminary Round tie where they beat Zimamoto 5-2 on aggregate. Tovey represented Chiefs in the 1990s along with his brother Neil, who is currently SAFA's technical director of football. Speaking to Kickoff, he said: "They haven't got the results they should have got, and I don't believe...as I said to somebody else at Chiefs yesterday, they are not the Chiefs of years ago where teams use to fear them. They don't fear them anymore so, they have lost that little bit of a positive fear from the opposition. They don't fear them anymore. "It's tough when you are an international coach as an European coach to come and coach our players. So it's tough for me to judge him. [We] can only judge him on results because I don't know the training sessions. "It's all about performing for the supporters. You need a coach...it's all about man-management skills, how you can raise the level of the player and perform, that's also up to the players. But the man-management skills have to come from the coach. "Unfortunately this game is about results. It's about results so...but you have got to make sure if you are going to fire the coach, you've got to make sure you have somebody to replace him who can actually fix what happens now."